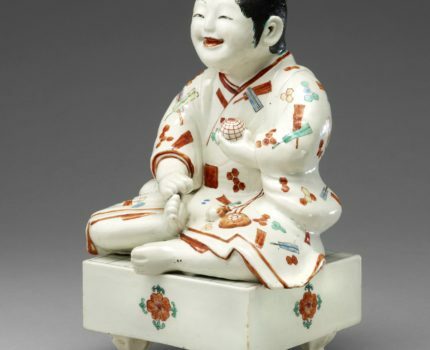 This year is the 400th anniversary of the birth of porcelain in the town of Arita in Saga Prefecture, Japan. This lecture will examine in detail the past, present and possible future of the Kakiemon kiln which has been in operation in Arita for almost 370 years, under the same family management. The Kakiemon kiln is still modeled on the traditional Japanese early modern workshop system. Succession is based on the principle of iemoto or ‘head of the household’, the oldest son inheriting and sustaining the brand and workshop. The current head of the kiln is Kakiemon XV. He recently received the title following the death of his greatly admired father Kakiemon XIV in 2013. Historically, the Kakiemon workshop produced some of the most exquisite porcelain for export to Europe and the Middle East, notably in the later 1600s. In 1647 Sakaida Kizaemon was credited with introducing the overglaze enameling technique to the Arita porcelain kilns, making advanced porcelain production possible and starting the potting dynasty. Classic Kakiemon style, lasting from 1670 to 1700, is defined by its refined yet sparse decoration executed with bright overglaze enamels in a palette of orange-red, green, blue and yellow. The classic style Kakiemon style, however, ceased production in Japan the 18th century, but its popularity continued and the style was reproduced in China and in Europe. In Japan there was a revival in the mid-20th century of traditional Kakiemon style due to the ingenuity of Kakiemon XII and Kakiemon XIII and post WWII regional regeration funding by the central Japanese government. For his efforts and artistry, Kakiemon XIII was awarded from the Japanese government ‘Living National Treasure’ status for his revitalisation of the classic Kakiemon style. His son, Kakiemon XIV continued the legacy of his father while also developing the Kakiemon brand through inspired naturalistic designs. Kakiemon XV is now poised to take the revitalised Kakiemon legacy forward. Nicole Coolidge Rousmaniere is the founding Director of the Sainsbury Institute and Professor of Japanese Art and Culture at the University of East Anglia. She received her PhD from Harvard University in 1998. She spent three years on secondment as a Visiting Professor in Cultural Resource Studies at Tokyo University (2006-2009). From Summer 2011 she is Research Director of the Sainsbury Institute. She is currently seconded to the British Museum as IFAC Handa Curator of Japanese Art in the Department of Asia.